You may want to animate individual elements of a table such as rows, columns, or cells. PowerPoint lets you animate the entire table, but not its elements. Likewise, you may want to animated individual portions of a chart. Note: Charts have their own animation settings, which may work fine for you. If they do, you don’t need to use one of the methods below. Select the chart and add an animation, such as Appear. In the Custom Animation task pane/Animation pane, click the animation’s down arrow and choose Effect Options. On the Chart Animation tab, choose one of the options from the Group Chart drop-down list. For more information on ungrouping a table in 2003 and the chart animation settings, see my tip Animate a chart or table. Here, I offer two methods of animating a table in PowerPoint 2007 and 2010. In order to animate individual elements of a table or chart, you need to ungroup it. However, PowerPoint 2007 no longer lets you ungroup them! For tables, apparently, this was required to allow larger table sizes, up to 75 rows by 75 columns. When you ungroup a table or chart, you lose effects and non-solid fills. Also, editing the contents of the table will be more difficult. 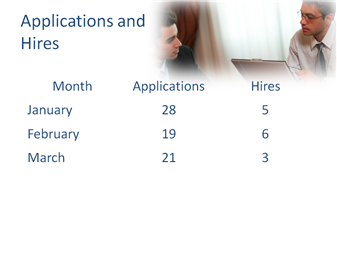 You may want to make a copy of the slide first to retain the full table. You can hide the slide. To hide a slide in 2007 and 2010, go to Slide Show tab> Set Up group> Hide Slide. Alternatively, you can copy and paste the table itself and drag the copy off the slide. Warning! Before doing this process, be sure to format the table or chart the way you want it, including the size of the text, the solid fills, and the borders. The process will convert the table to lots of individual objects and formatting them all is quite difficult. Select the table or chart and cut it to the Clipboard (Ctrl+X). Go to Home tab> Clipboard group and click the Paste down arrow. Choose Paste Special. 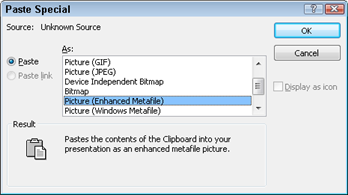 In the Paste Special dialog box, scroll down and choose Picture (Windows Metafile) or Picture (Enhanced Metafile). A metafile is a vector type of image. Click OK.
Move the table to where you want it. The table is now a grouped object, so you need to ungroup it. Right-click and choose Group> Ungroup (or press Shift+Ctrl+G). Click Yes to confirm converting the picture. Then ungroup the table a second time. You should group together elements that you want to animate together. Delete elements that you don’t need. For example, you may not need the rectangle that borders the entire table, so you can select and delete it. To group elements, select them and right-click. Choose Group> Group (or press Ctrl+G). When you’re done grouping elements, you’re finally ready to animate them. Select the element you want to animate and follow the steps below. Go to Animations tab> Animations group> Custom Animation. In the Custom Animation task pane, click Add Effect> Entrance and choose the type of animation, then the specific effect that you want. Adjust the parameters of the effect, such as the timing and how it starts. Go to Animations tab and click Add Animation. From the Entrance section, choose the type of animation you want. This table uses the Appear animation effect to animate each row of the table. A trick that you can use instead of ungrouping the WMF is to cover each row of a table with a rectangle, then add an exit animation. From the Shapes drop-down list on the Home tab, insert a rectangle to cover each row. Fill the rectangle with a background fill. To do this, right-click the rectangle and choose Format Shape. In the Fill category, choose Slide Background Fill. To remove the border, in the Line Color category, choose No Line. Repeat with the other rectangles. When you go into Slide Show view, each click will uncover a successive row in the table. This was very helpful!! Saved my presentation! I love these very cool techniques that get the job done in the best possible way when you need a work around. Thanks much! Thanks for this – the rectangle trick worked a lot better than I expected. Thanks a lot for these tips! The ungroup tip has worked perfectly for me! Worth mentioning that although the selectively uncover tip will work well for presentation, it wont work if handouts need to be printed. Absolutely right! That’s because the rectangles covering the table or chart print out. You could create a copy of the presentation without the coverups, but one of the other solutions would probably be easier. I was doing a powerpoint presentation and I inserted a clip art from the clip organizer and it was the wrong one .How do I remove the unwanted clip art?It is powerpoint 2010. Not sure I understand. Is this related to animating a table or chart? If you insert any image, just select it and press the Delete key on your keyboard to delete it. Somehow, I’m guessing that’s not what you mean, though. Yes ,that was it .I selected the image and push delete.Thank you for your quick response and it is always the simple things. Unfortunately, the ungroup trick didn’t work for me – my presentation is in Hebrew, and when I ungrouped the font went wacky and I got either wierd symbols or questions marks. I used to use it all the time with my good old Win’ 98, and I really miss that option. The ungrouping went well, but the text in the table that was in Hebrew turned into giberrish. I tried another method and it workd. Then went to 4th slide removed 5th row; from 3rd slide removed 4th and 5th row and so on. Now when I run the show, the rows gets added at the end; this seems easier. It would work, but if you had to change some data in row one, you’d have to edit 5 slides. Ideally, you want it all on one slide so it’s easy to edit. IS there a way to preserve special characters? This was SUPER helpful. Thank you for posting!